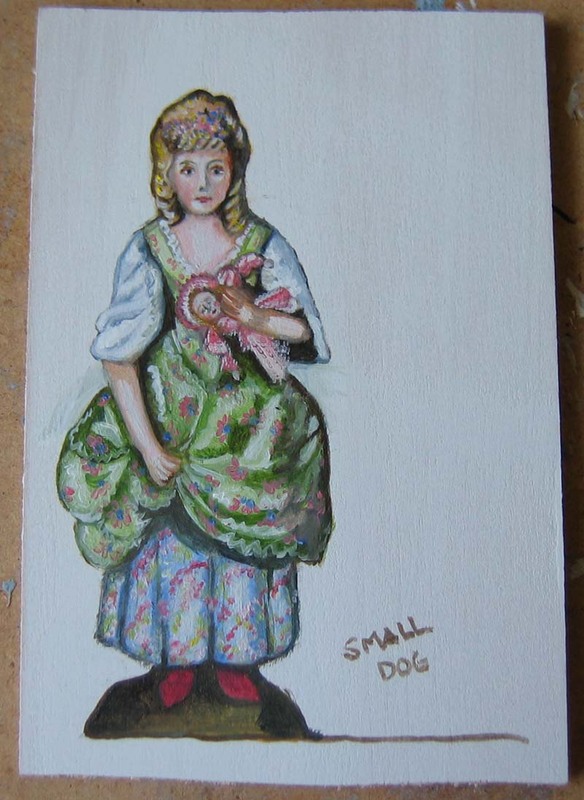 I worked on both the mini cat fireboard and the girl with her doll yesterday afternoon. Here they are for you to look at. It won’t be long before they can have the final detail and be cut out. Small Dog’s photos got lost in the ether and Sandra is on a camping trip at the moment so we shall leave our canine creation till later. Special attention had to be paid to the pattern on the dress of the “Lydiard girl”, as if you remember in the original, we had very little to go on. We have managed to make the face quite sweet and the doll does look as if she is squashed against the little girl’s body too. These were our major problems when trying to create a nice figure from two not very distinct originals. If you need to refresh your memory about the Lydiard girl and the Easton Neston girl who are our inspirations, then this will help…“You lose some, you win some”. RULE NUMBER ONE – PATIENCE – something that we MUST HAVE. It is not possible in oils to paint something great straight off unless you are merely drawing with the paint and one colour at that. If you tackle your subject again before it’s dry enough you will have an unholy fudgey blotch. 🙂 Believe me, even the small works can become a mess…more quickly than larger paintings, actually. This is where acrylics score but they can’t be ‘worked’ like oils and sometimes, that is what is needed. 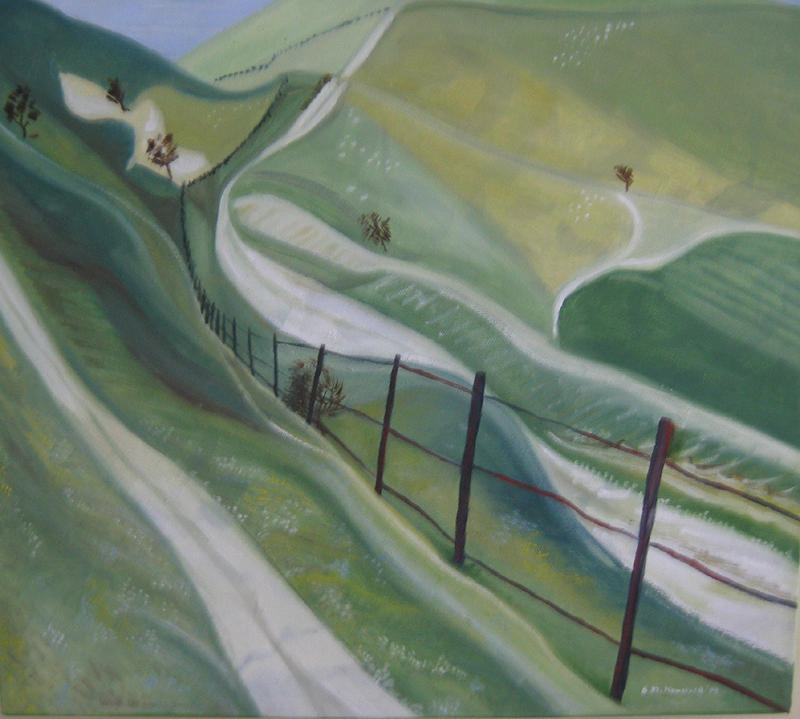 The above picture ( forgive me for using one of my more modern full sized creations- Under the White Horse ) is a perfect example of how to stroke the paint the way you wish the viewer to imagine the actual object is going. 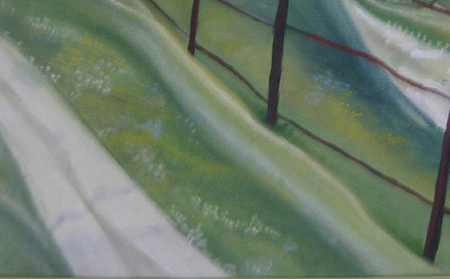 The paths grass and shadows are all painted so that the illusion of fallng down a slope is created. Look carefully at your original. What can you keep and what can you leave out. I’ve touched on this before. Unless you are one of those painters who can execute a Mona Lisa on a grain of rice, ( sadly I’m not one of those – but I am practising…. ) 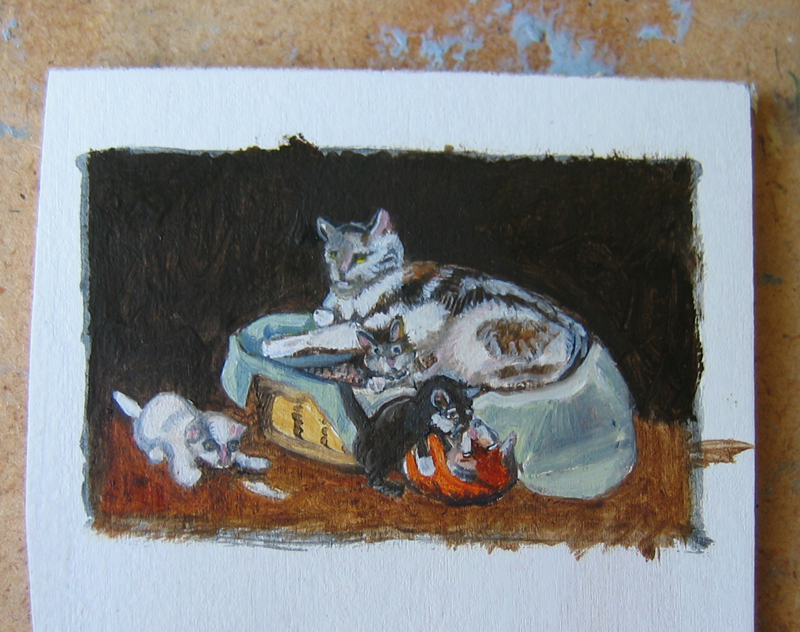 it’s not possible to put every tiny detail into your miniature, especially when it is as tiny as the kittens in the fireboard. RULE NUMBER THREE Distill the essence. Find out what makes the composition work, what makes it appear as if it has all the elements and stick with those features. If you don’t you will have one of those fudgey messes again….this time because you are trying too hard. On the last coat of paint…and it’s up to you how many you do- but remember there is such a thing as overworking a piece, you can work on wet- ish paint as the joy of oil is that it blends and moves. 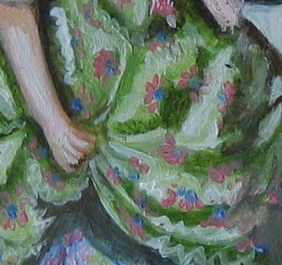 I find that the more I work a piece the more real it gets and for example when painting the girl’s dress we can get a look of fabric by blending the folds together and adding the highlights in a colour whitened with Flake white. We then stroke this along the patches we need to pick out. RULE NUMBER FIVE- don’t overwork ie: add too much paint but do work what you have. Rather an exaggeration but you get the point ..and a pun thrown in ! I shall be sending round an examination paper later – to make sure you have all been paying attention! This entry was posted on 27/04/2010 at 10:27 am and is filed under Uncategorized. You can follow any responses to this entry through the RSS 2.0 feed. You can leave a response, or trackback from your own site.